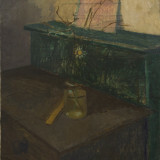 Published to accompany the exhibition at Piano Nobile, William Coldstream | Euan Uglow: Daisies and Nudes is a fully illustrated catalogue exploring the unique personal and artistic relationship of two of the foremost proponents of post-war figurative painting in Britain. 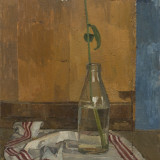 In the years following WWII, Uglow studied under Coldstream first at Camberwell and then the Slade School of Art upon Coldstream’s election to Professor. Even amongst a young group of exceptional painters including Craigie Aitchison, Michael Andrews and Howard Hodgkin, Coldstream immediately recognised Uglow as a precocious talent, enrolling at Camberwell aged just sixteen. Coldstream and Uglow’s relationship evolved from that of teacher and student into one of mutual influence and sustained artistic dialogue, continuing throughout and beyond Coldstream’s lifetime. Both renowned for their painstakingly methodical painting processes, neither was prolific and thus their works remain rarities, infrequently seen. The first exhibition to examine this relationship, the catalogue presents a carefully edited selection of major works, from nudes, still-lifes, cityscapes and portraits.